The mouth goes through major changes over a lifetime. A baby will typically start to erupt his/her first tooth between five and nine months. The last set of teeth to erupt are the third molars, located at the back of the mouth. The third molars, commonly referred to as the wisdom teeth, will usually make an appearance between the ages of 17 and 21. They got the name “wisdom” because they tend to come in when people are at a more mature age. Healthy wisdom teeth that come through correctly help an individual to chew food. On the other hand, if they come through incorrectly, they can become a nuisance. An individual should see a dentist every six months for regular cleanings. During a regular visit, your dentist will perform X-rays and be able to monitor when and how your wisdom teeth will come in. If the teeth come in incorrectly, pockets can form underneath the tooth, creating an area for bacteria to accumulate. In an area that is already hard to clean, the bacteria can lead to infection and gum disease if not removed. If left untreated for a long period of time, the oral bacteria can travel through the bloodstream and cause infections in other major organs of the body, such as the heart and kidneys. Furthermore, if there is not enough room in the mouth for the wisdom teeth to properly break the surface of the gums, the teeth may become impacted. An impacted wisdom tooth can harm surrounding teeth, causing damage due to infectious bacteria that can spread to surrounding areas of the mouth. 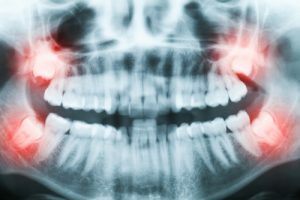 In more serious cases, cysts and tumors can form at the base of the teeth and cause major damage to nerves, teeth, and other tissues in the mouth. It becomes imperative that the wisdom teeth be removed if they become impacted or come in incorrectly. You and your dentist will develop a treatment plan to decide when you will need to have the teeth removed to prevent infection and damage to other teeth. Wisdom teeth removal is done under sedation—the type of sedation will be determined during your consultation. The procedure to remove the teeth takes about 90 minutes typically. Discomfort and swelling usually occur for up to three days, with healing time taking about one week. However, if the holes are left open, it can take six weeks for the tissue to repair itself. If the holes are stitched, the sutures (usually dissolvable) will dissolve in seven to 10 days. Some people will not ever develop wisdom teeth. Lucky for them! Additionally, there is a small percentage of people who do get wisdom teeth and have enough room for them to come in correctly. If the teeth are without pain, cavities, or infections and are in an environment with good oral hygiene and healthy gum tissue, then keep them. In this instance, the teeth can be treated like all others. It is important to floss and brush daily and visit your dentist for regular cleanings, so your wisdom teeth can be monitored, and you can ensure overall dental health. If you think you might need your wisdom teeth removed, you can request an appointment for a consultation with cosmetic dentist Dr. Sands by calling 310-273-0111. This entry was posted on Monday, April 23rd, 2018 at 3:16 pm	and is filed under Wisdom Teeth. You can follow any responses to this entry through the RSS 2.0 feed. Both comments and pings are currently closed.